L'inLab FIB a la Hackaton Mobility BCN! Last March (11,18 and 19) the Hackaton Mobility BCN was held at UPC organized by CARNET and sponsored by SEAT and ALTRAN. In this edition, it was proposed to carry out developments related to Smart Mobility and the use of new technologies: smart vehicles equipped and last generation mobile phones, that integrate devices like cameras, Bluetooth or Wi-Fi to have access to data that allow to improve the experience of mobility in the city in the near future. In the competition, the hacker was able to participate in three possible categories: Smart Mobility, Driver Experience (apps) and Driver Experience (hardware), with a prize of 2,000 euros per category. Within this context, inLab FIB collaborated introducing the possibility of making use of the first results obtained at the European project BIG IoT. This project aims to improve the interoperability between Internet of Things (IoT) platforms from the development of a common place (Marketplace) where sharing services and applications related to providing or consuming IoT data. 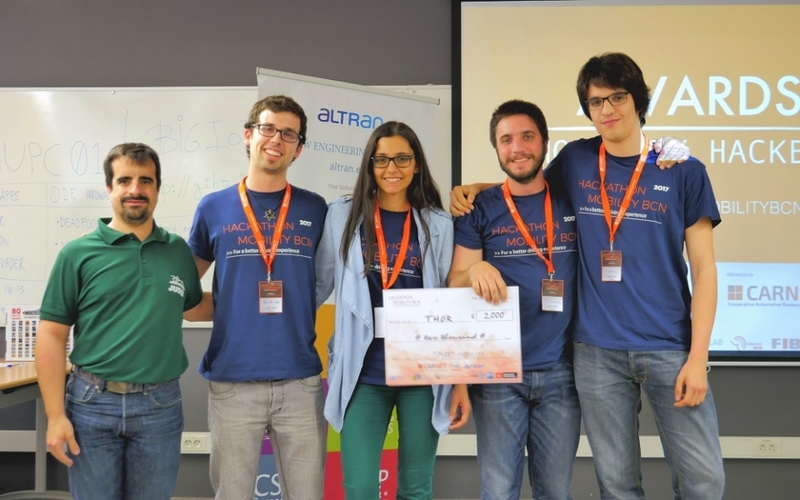 In particular, the inLab FIB's BIG IoT team (Juan Salmerón, Alex Català and MªPaz Linares) offered technical assistance throughout the hackathon, as well as a previous training session on the use of BIG IoT resources for hackathon developers . Also noteworthy is the participation of Rosa María Martín and MªPaz Linares as part of the hackathon jury in the categories of Driver Experience (apps) and Smart Mobility, respectively. The inLab's team (Team Thor) formed by Marc Vila, Ester Lorente, Francesc de Paula Puig and José de Cid won the 1st prize of the Smart Mobility category with a microcity-based application, a new challenge of the Smart Cities which it aims to integrate services to users with modal interchange nodes. A good example to illustrate the winning application could be the case where a user from outside Barcelona wants to go to a certain point within the city. The developed application recommends the user to park his private vehicle in a parking of the microcity located in Barcelona providing a route from its origin to this point.Then it recommends you to continue your journey by changing modes, encouraging the use of public transport that is supposed to be integrated (or near) the parking spot in the microcity. Finally, the application informs the user of other services available in the microcity in which he parked. It also proposes incentives (through discounts for using the app) if the user follows the modal shift recommendations. It should be noted that the inLabers team also won the special BIG IoT mention that rewarded the integration of the resources of the BIG IoT project (bookshop, etc.) within the project developed in the hackathon.